ESAR is always looking for volunteers! Whether you can dive, operate a boat, search in the woods, or simply want to provide some other type of support (vehicle / vessel mechanics, building maintenance, etc...) we have a job for you. You must have a clean record, but all skill sets are welcome and we provide training. The best way to sign up is to come to our General Meeting on the last Wednesday of each month at the ESAR Building, 9530 Nims Ln., Pensacola, FL 32534. Our meeting starts at 7:00 pm with a brief training or instruction. Then there is a brief message about what is happening in ESAR in general. Then the different Commands (what we call our functional units like Dive, Land, Marine Operations, etc...) break off into their own areas for Command-specific information. 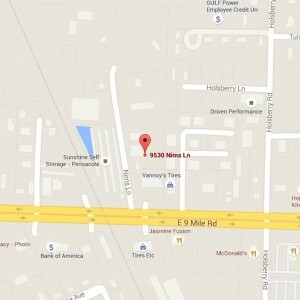 You can click on the map to see our location, and get directions.